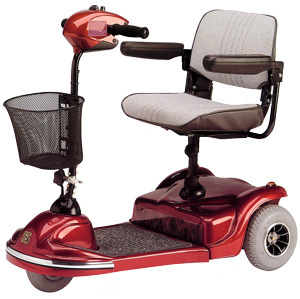 The Sunrunner 3 is a mid range 3 wheeled scooter which is comfortable and manoeurable and suitable for users weighing up to 115 Kilos (250lbs/18st). Its three 8" pneumatic tyred wheels give a smooth ride even over uneven ground. The Sunrunner 3 turns virtually in its own length enabling it to be driven into areas where space is limited making the Sunrunner 3 ideally suitable for shopping. It is supplied with a shopping basket, anti tipping wheels and a comfortable seat with flip up arms to enable users to exit the scooter with ease. With a range of approximately 19 miles between charges journeys to town or exploring the surrounding area are accomplished with ease.